Presenting work neatly and inventively can help students to take pride in that which they produce. Students who favour Arts and Crafts can bring their passion and skills to other areas of the curriculum. Furthermore, original presentations linked to the theme of the task can bring the subject matter to life. In these ways, careful presentation can be educational as well as enjoyable. Encourage your child to think about the look of their work as well as the content. It is important to present work in ways appropriate to the task at hand. For example, it would be more fitting to illustrate a short story than a Geography essay. Discuss these issues with your child to get them thinking about what is appropriate, when and for what. They might even like to speak to their teacher about what is expected and favoured. As a general rule, illustrations should always link to the subject matter of the work. Diagrams and graphs are excellent choices. Illustrations can be included when completing more creative tasks. Coloured pencils often produce neater, more subtle results than felt tip pens. 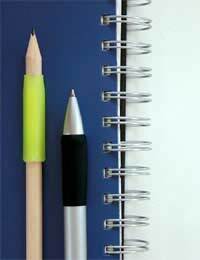 These can be used for gentle shading, eye-catching underlining and useful colour coding. Where illustrations, diagrams and graphs are not required, students might like to draw thin, neat borders around their work. A ruler and coloured pencils can be used for this and it need not take more than a few minutes. Writing on paper they have decorated in advance often encourages students to think more carefully about the presentation of the whole piece; handwriting automatically becomes neater. Have I used a ruler? Have a written a title? Have I underlined my title? Have I written neatly? Have I left an appropriate amount of space between each word? Have I followed my school's handwriting guidelines? Have I written on the ruled lines? Have I drawn diagrams and graphs with a pencil? Are all mistakes crossed out neatly? Have I written the date on my work? Have I written my name and form on my work? Have I used the appropriate pens, pencils and colours? Have I coloured within the lines? Have I used subheadings where necessary? Have I spaced my work out so that it is clear for readers? Such a check list will encourage your child to take pride in their work. In time, they will begin to do all the above automatically. Many students find that presenting tasks well helps them to better remember the subject matter that has been covered; this is particularly true for visual learners. Regardless, developing strong presentation skills will stand your child in good stead for the whole of their school, college and university career and starting early is a sure fire way to ensure success.